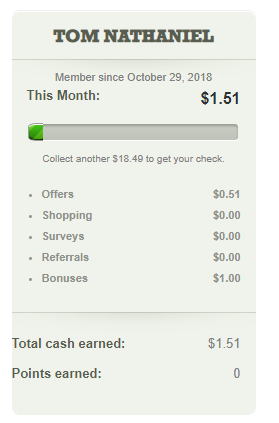 CashCrate Review: Can You Make $100+ a Month? NOTE: CashCrate is shutting down effective March 31, 2019, and is now referring all members to join Swagbucks. I’ve been part of CashCrate.com for quite some time now, and in fact, they could almost be considered the early pioneer of GPT-like websites since they have been around since 2002. Paying close to $4 million to date, with payment proof via the official “check gallery,” CashCrate is, indeed, legit in paying its members, but is it worth joining? In my review today, I wanted to tell you what I thought about the company and if it’s worth your time. Before I get started, let me explain what CashCrate is for those who may not be sure or maybe happened to land on this post to see what CashCrate is all about. Referred to as a GPT (get-paid-to) website, CashCrate will pay you to complete offers, playing games, watch videos, take surveys and even refer your friends and family. And in doing so, the company will reward you with cash, in which you can then cash out via a paper check mailed to your home. Aside from getting cash, the company also offers points, in which you can redeem for popular gift card choices, such as Amazon, iTunes and Starbucks, to name a few. There are a lot of choices, nonetheless. All in all, the concept is simple. Follow the directions, complete the task and then get rewarded for the amount listed. This can be said about any GPT site. For example, you may have to fill out a survey about your shopping habits or you may have to visit a website and share your thoughts. Really, the choice is yours and you’re never forced to fill out an offer. Offers are added daily, so if you do decide to join, be sure to check in daily as the company will reward you in doing so. 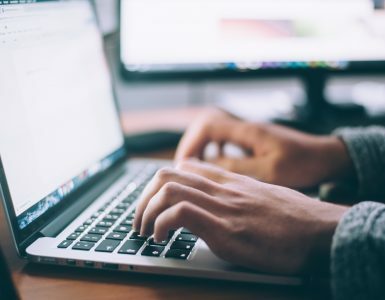 As a fair warning, these websites can be a great way to make a few dollars, maybe as much as $30 to $50+ a month; however, DO NOT expect to quit your day job with these websites. It’s just not possible unless you have thousands of referrals who are earning money daily. Even then, would you rely on this site for a job? I know I wouldn’t. Now that you hopefully know what CashCrate is all about, let’s get into my honest detailed review. CashCrate.com Review — 100% Legit or Scam? 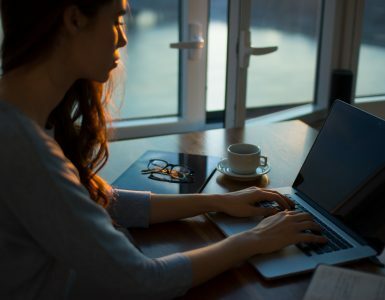 If you’re landing on the homepage for the first time, it appears to be quite busy, listing the ways to earn, which members are making money at the time (in real time), as well as the “featured offers,” along with the payment for each offer completed. Aside from that, the header had a few popular links you may want to bookmark for later, including the frequently asked questions and a forum, which has sadly become a rarity in the GPT world. This forum could be a great way to learn about the site in depth since the discussions come directly from the members. Today, it seems as if none of these companies, at least the ones I research, offer a place to speak your mind, aside from third-party resources, such as Reddit, etc. And on the footer, they offer a simple free cash guide, a survey guide and a simple guide as to how you can make money on the website. These are very short guides, and I recommend you at least check them out if you’re interested in the website. In essence, they talk about what I’m talking about here — how the website works and what you need to do in order to earn cash. While you can see a few of the featured offers on the website, CashCrate did force you to sign up if you wanted to see a full list of offers, which was kind of an annoyance. But hey, signing up was free and only took me less than two minutes to start seeing my offers. 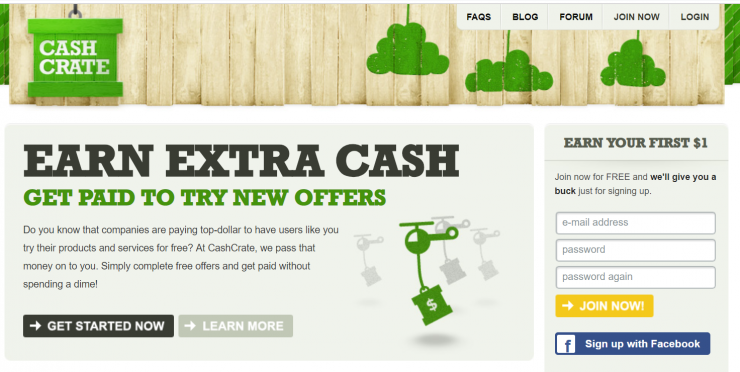 CashCrate makes signing up easy, and if you’re lucky enough, they may even PAY YOU to sign up. For instance, they gave me a $1 for signing up, but this isn’t guaranteed. On the main page, if you do decide to sign up, they will first ask you for your e-mail address, followed by a password of your choice. You can also sign up with Facebook if you wish, but personally, I never link my social media accounts for any of these websites. And once you click the sign-up button, the website will then ask for your contact information so that the company can put this information on file to send you a check if you meet the minimum threshold. They also offer Direct Deposit for USA members and PayPal for countries that accept it. 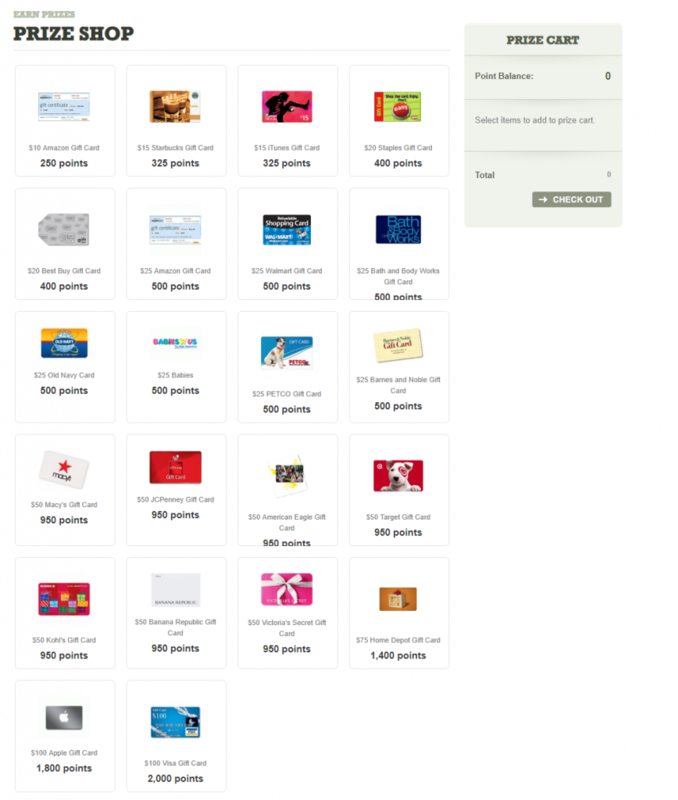 In the case you earn points, then you can cash them out for gift cards once you earn enough. I will get into this later. All in all, signing up took me less than two minutes and I was able to access my dashboard immediately after confirming my e-mail address. 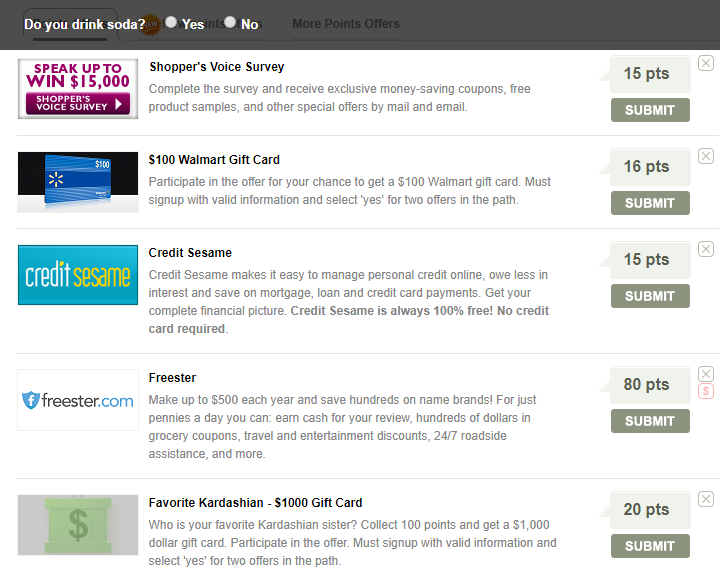 From here, you have a variety of ways to make money, from offers to surveys or even videos (as seen above in the screenshot), and the thing I like about CashCrate is that they have a lot of awesome unique offers. For example, on my dashboard, I had 28 offers available for my personal account and prices ranged anywhere from $0.50 to fill out my profile to as much as $4 if I joined a company called Freester. With ANY GPT website, you won’t get rich doing offers, maybe up to $5 to $7, and honestly, they don’t refresh all too often once you complete them. Plus, a lot of these offers will bombard you with a ton of e-mails, so be aware if you plan on giving out your personal e-mail. And if you want to give out your credit card number for a free trial, always read the fine print because there’s a 99% chance you will be charged in the future for the service if you do not cancel. While the offers look okay, just make sure you never did the offer before and follow the directions closely to get your credit. The second tab, being the surveys, is, in my opinion, where you want to focus the most. 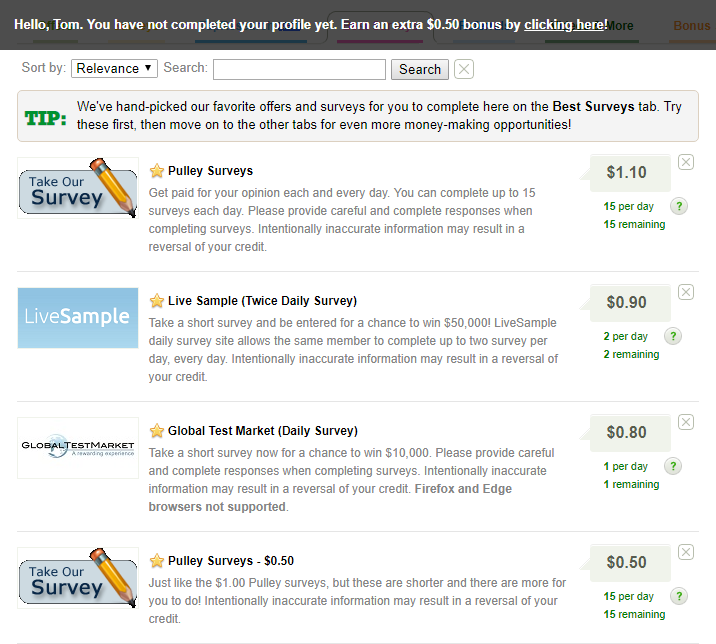 IF you want to make any money while playing around with these types of websites, surveys are where it’s at. 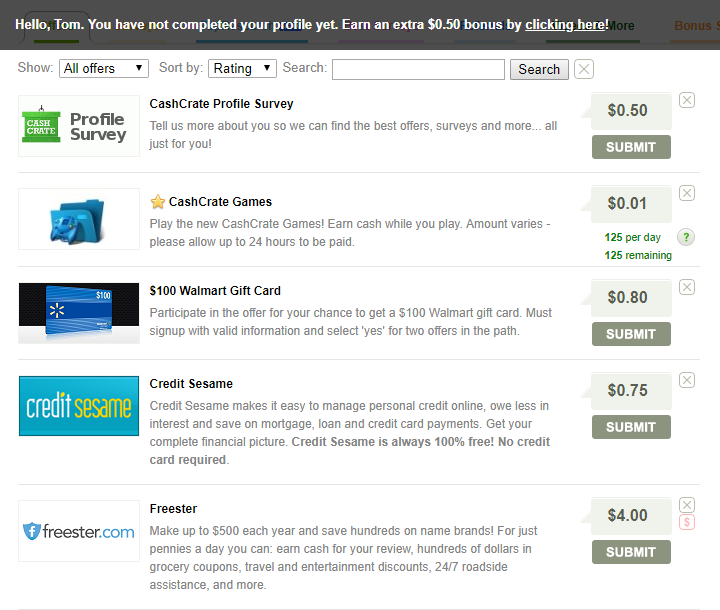 Surveys are added daily, some can pay up to $100 (not on CashCrate) on other websites and some are extremely easy to do. And, as long as you fill out your profile in depth, you can increase your chances of landing even more opportunities since the research companies will know more about you. Now, the surveys on CashCrate, at least from my dashboard and demographics, paid anywhere from $0.25 to $9+ or so, with the average survey taking about 5 to 10 minutes to complete. Most surveys, however, paid less than $2. If interested in taking the surveys, again, it’s straightforward. Read the description to see what’s the survey is about, and then pay close attention to the “estimated length.” If the payout is only $0.80 and it will take you 15 minutes to complete, then it’s probably a good idea to skip that one. For instance, on that screenshot above, the $9 was worth my time. Only 10 minutes AND I earned $9 — not bad. Browse this list to see if any are worth your time, but remember, even though it’s on your dashboard, it DOESN’T mean you will qualify, so do keep that in mind. I applied for six and was disqualified for five, kind of a bummer. Just be honest and take your time while answering because they do throw in trick questions that may catch you off guard. TapResearch was new to CashCrate when I joined and was another way to earn, but I will touch upon it really fast. 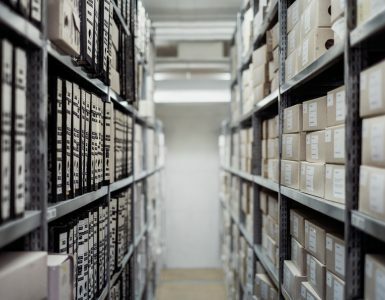 Known as an “offer wall,” these companies (TapResearch) will connect with GPT websites online, offering their own offers, which the GPT website, CashCrate, in this case, will post on their website. Basically, they will insert a piece of code and it will connect to the offer wall, allowing you to access their website inside of their website. Since other GPT websites use these same offers walls, you can only perform the offer once, so if you do want to take advantage of these offer walls, I highly recommend two things: either compare the payout rates among your favorite GPT websites and choose the highest paying offer or make sure you just complete the offers on your favorite GPT website to help build your cash/point balance. While there can be some great offers on these so-called offer walls, some GPT users get annoyed seeing them on multiple websites since they are not considered unique. I only had a few offers available, 7 to be exact, and next to each survey offer, it stated the number of surveys remaining, which simply meant you were limited to the number you could do. For example, via the screenshot above, I could complete up to 15 surveys on Pulley Surveys, while I could only complete 2 a day via Live Sample. I can’t say it enough: surveys will make you the most money, so focus on these tabs. And while you won’t get rich, you can make $20 to $50 a month if you’re very consistent. Again, don’t plan on making the full amount 100% of the time since they can disqualify you. For every new member you refer, CashCrate will pay you up to 20% of what they make and a percentage of what their referrals make. And if that’s not enough, the company will throw in a $3 bonus when your referral earns their first $10. 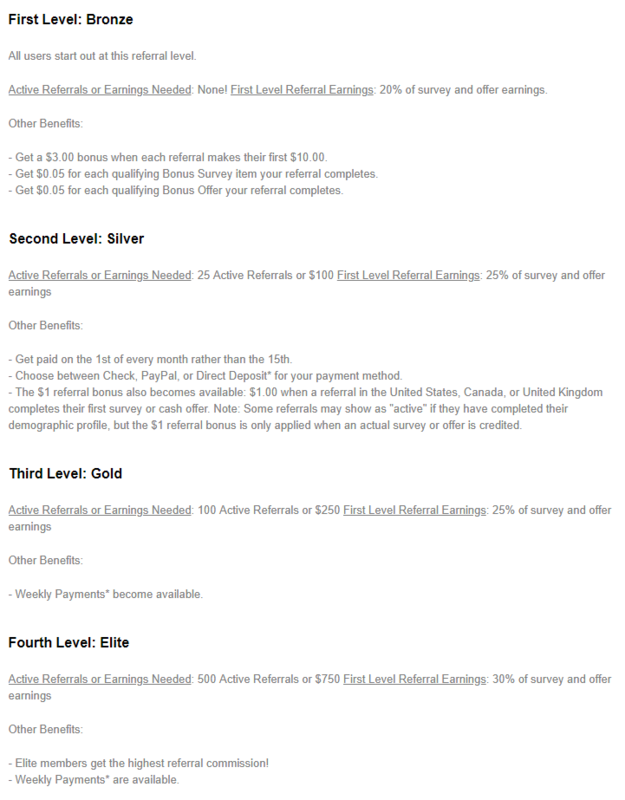 As you gain more active referrals or first level referral earnings, CashCrate will move you up the rank, with the fourth level, the Elite, earning you the most — 30% of the survey and offer earnings and weekly payments available. Almost all GPT websites offer some sort of referral scheme, and honestly, CashCrate’s isn’t that bad. So if you know of people or have the power to refer a lot of people, this may be something to look into as the Elite level, again, could earn you 30% of your downline’s earnings. Inside the “Videos & More” tab, CashCrate works with a lot of offer walls, such as Persona.ly, RadiumOne, Encrave, OfferToro and SuperRewards, and these can be found on a lot of GPT website. It appears they had their own unique videos as well. I touched upon these offer walls prior, but if you use ANY of these offerwalls elsewhere, you may not be able to perform them while logged into CashCrate. And while watching videos may sound tempting, they don’t pay much. I’m talking a few pennies per 10-12 videos, but if you don’t mind opening the video player and watching a few, I guess it could add up a smidge over time. To put it in perspective, I watched a video and made $0.02. To earn, CashCrate just tells you to open the player and bonus video credits will instantly post after watching them, and in some cases, you can watch them multiple times if the advertisers allow. And aside from the CashCrate bonus videos, again, you can use the offer walls to earn money as well. In the past, I did write on a few resources where you could make money while watching videos, but again, don’t expect much. TIP: Plan on making $0.02 per 30-second video. 99.9% not worth it unless you really want to watch an ad. 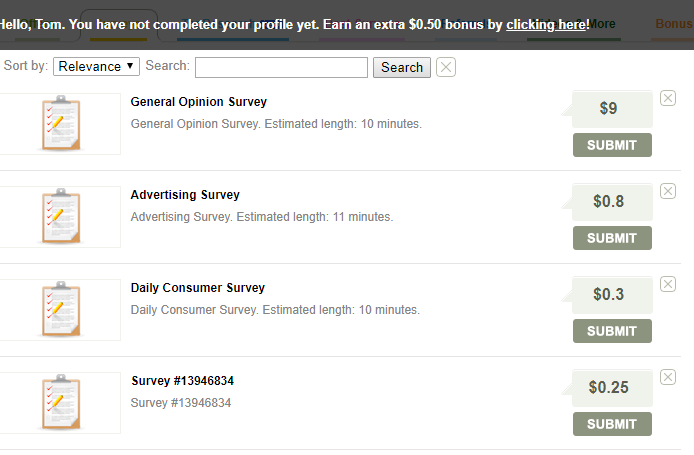 Yet another tab, the “Bonus Surveys” tab will connect you to an offer wall, which, again, connects you to a third-party. In my case, it was PeanutLabs, and from my previous reviews, such as my PrizeRebel review, I quickly found out a lot of these top-rated GPT websites will work with the same offer wall companies. AGAIN, if you want to take advantage of these third-party offer companies, either research the best payout on your favorite GPT website or attempt to complete the offer on a website where you want to build up your balance to cash out. TIP: Be sure to check out other GPT sites because CashCrate DOES NOT offer the highest payouts here in some cases. The “Bonus Offers” tab, similar to the “Bonus Surveys” tab works with yet another third-party provider. And while there’s nothing wrong with that, do keep in mind that if you have completed any of the offers mentioned on the page, then I would highly recommend you skip it as most companies will not credit you for duplicate submissions. 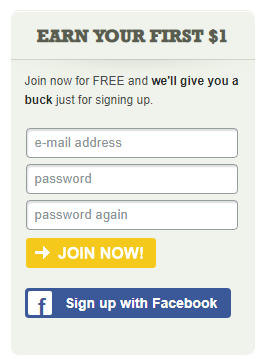 Glancing at this tab, it looked as if you could sign up for free trials, free offers or take surveys if you wish. Not unique to CashCrate, take a glance at this page to see if anything is of interest but don’t expect to make a lot. TIP: These offers are more than likely from a third party feed, but don’t let that deter you as some reviewers online actually say CashCrate offers some of the highest payouts, even if it comes from a third-party. Unique to CashCrate, they will credit your account whenever you play one of their games, with no limit to the number of times you can play! And it appeared they would reward you based on your high score. Curious about this, I decided to play a slots game to see what I could earn, and after about three minutes of playing (and losing a lot of points), I went ahead and clicked the “submit score” button. 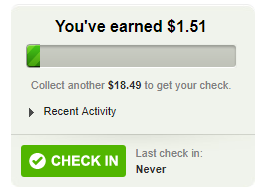 In doing so, it said I earned $0.01 or about $0.01 for about 3 minutes of my time. BUT I’m not sure if the points change if you earn a higher score, so you may want to try it to see what you can earn. In the end here, have fun with it, but don’t expect to make a ton. While some of the games were fun, it was just annoying to watch the ads inbetween levels, but I guess this is how they make their money. This is probably the easiest way to make money on CashCrate and all it takes on your part is a simple click of a button. Whenever you log in, be sure to click the “check in” button to earn $0.03, and while Cashcrate will recommend an offer, it isn’t necessary to complete it; however, you will have to click the offer to at least earn your $0.03. Aside from paying you in cash, CashCrate will also pay you in points, which, as I already mentioned, will allow you to cash out for gift cards and more. 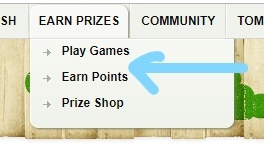 Clicking on the “Earn Points” link, which is available via the “Earn Prizes” tab near the top, I was able to view a few unique CashCrate offers, as well as some offers from third-party websites. The selection seemed slim, but if you want to pad your points balance since you plan on playing games, then you may want to check out a few to see if any are of interest. In a minute here, I will explain how you can redeem your points for some pretty good gift cards. Keep in mind that points will be separate from your cash balance. While you’re not guaranteed to win, the “Live! Contests” Page is a pretty cool way to potentially earn prizes and have fun in doing so. The trivia is often live and will take place inside of a chat room, and during this time, the moderator will ask a trivia question to the room, with a box where you can insert your answer. Then, if you answer it right and fast enough, each question will have its own value, generally based on how hard it is. Each question has a limit to how many people can win it, and once the cap is reached, then no additional answers are allowed, even if you do answer it right. And then, once the contest ends, trivia prizes are awarded after a short audit, sometimes as high as $20! According to the fine print, contests begin at 8:00 PM Eastern time and will end at 9:30 PM Eastern time. Again, while you’re not guaranteed to win money, it’s a great way to have fun and potentially earn $20 or so. Aside from the live contests, CashCrate offers a regular contest, in which you can win prizes and you don’t even need to do anything. Generally, these contests will last a certain duration, and members can earn “presents” for each action you complete. 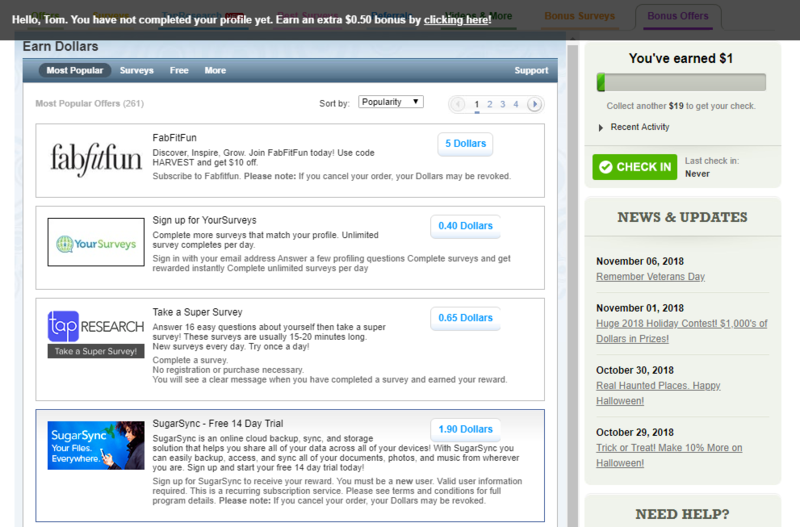 For example, when I was logged in, I could earn 20 presents for each survey I completed on the surveys page. Or I could earn 5 presents for each video item. Then, the top 50 members with the most presents would win a prize, which could be something such as a 128GB iPad Mini or a PlayStation 4 OR $200 Amazon gift card. To keep track, you can view the leaderboard near the bottom to see where you stand and if you have to complete more offers to get to the top. The contests page doesn’t require you to do anything, but it can be a great incentive to complete more offers/refer people to win some pretty cool prizes, so it doesn’t hurt to check out the page to see where you stand and if it’s worth completing the offers to win. If you are in the top 50 or close, then it would, of course, make sense to complete more offers to get toward the top. 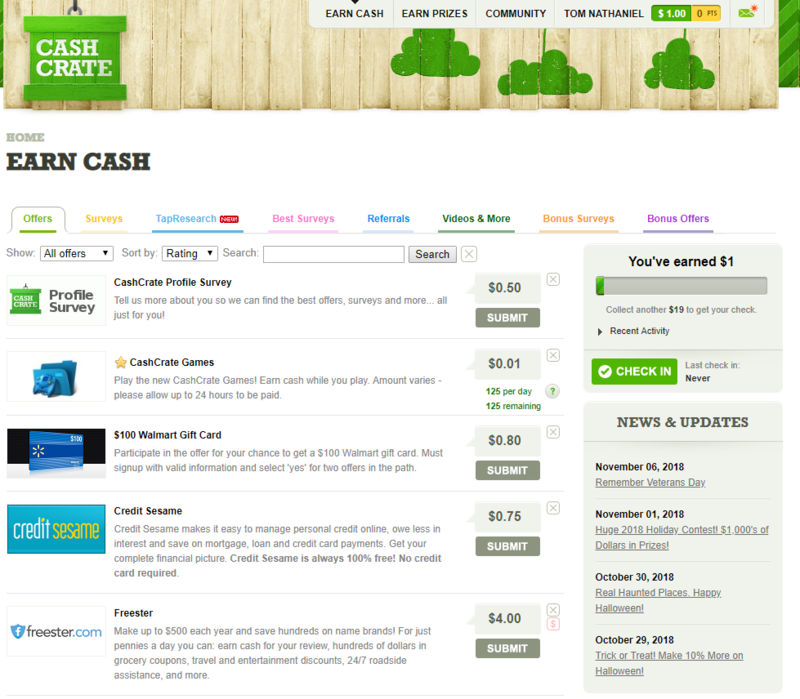 Now that I have reviewed the many ways you can earn on CashCrate, let’s now get to the good part — cashing out. Near the top of your screen, you will notice you have two balances: your cash balance and a points balance. With your cash balance, you can cash out when you reach $20, all of which you can track on your progress bar. This is pretty simple. Once you hit $20, you can then request a payment, either in the form a paper check (mailed to your address on file), via Direct Deposit (for USA residents only) or Paypal if your country and profile allows it. Simply hit the cash out button and you’re ready to go. For some, this $20 threshold is a lot, while others find it’s quite easy. I really think it depends on your demographics and the type of offers you want to complete. The points balance will be different than your cash balance as you will earn these points from playing games and competing in the points offer tab as mentioned above. To redeem, just add the gift card to your cart and check out. As with any GPT website or any product for that matter, there are going to be your pros and of course, your cons. 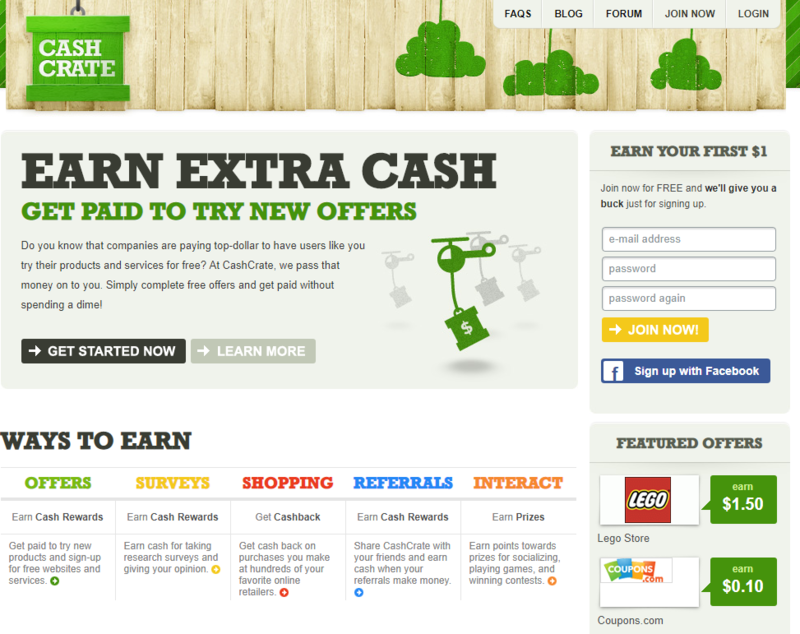 Researching online, I found CashCrate to be a mixed bag, with some people LOVING the website, while others complained. CashCrate has been around since the early 2000s, and as I mentioned, they were an early pioneer in the GPT space. They are trusted and offer a TON of proof that they do pay. Playing around with the website, I did like it. They had a clean interface, it was easy to find what I needed, and they credited my account super fast whenever I completed an offer. Plus, I liked that they offered A LOT of unique offers I couldn’t find elsewhere, such as the games. Plus, they put a twist on things, offering amazing contests, live trivia in the chat room and probably one of the best referral systems. In the end, unless you’re referring A TON of people, you probably can make $20 to $50 per month if you continue to complete the surveys and check in daily. JUST make sure you pay close attention to the offers you’re completing to make sure you’re not charged in the future if you decide to sign up for a trial offer. I don’t do the credit card offers, usually only the surveys, but I have heard bad things about the trials. If you’re not careful enough, you may be bombarded with a ton of e-mail spam and phone calls. 8/10 I do recommend the website and give it an 8 for a GPT-like website but is not recommended as a full-time job. It just isn’t possible. They do pay 100%, I can promise you that much and it definitely is not a scam. It’s also 100% safe. SO if you’re looking for a decent GPT website, add this website to your list and attempt to at least complete a survey here and there to earn a few dollars a month. And who knows? They may be offering a signup bonus right now. If you signed up, what are your thoughts? Let us all know in the comments as this can help the review!